Michael Seiter and Mark Stockman have recently published an article on life history and parthenogenesis in the two buthids Lychas tricarinatus (Simon, 1884) from Odisha province, India and Tityus trivittatus Kraepelin, 1898 from Argentina. The study clearly demonstrated that Lychas tricarinatus can reproduce without being inseminated by males after observations of captive-born females raised in isolation over three generations. Observations on the entire life cycle of most scorpion species are scarce, and the data shown for Lychas tricarinatus in this study are quite unique. The Tityus trivittatus used in this study were confirmed to be facultative parthenogenetic, producing both male and female offspring. The capability of a single population to reproduce by sexual as well as by asexual reproduction is probably a strategy to adapt to environmental circumstances enabling genetic variation. Observations on the entire life cycle of most scorpion species are scarce. Here, we present precise data of the embryonic and postembryonic development for Lychas tricarinatus with additional notes on Tityus trivittatus. By rearing captive-born Lychas tricarinatus specimen from the Odisha province (India) in isolation until maturation, we could show that virgin females gave birth to offspring proving that specimens are capable of parthenogenetic reproduction. Further, we describe an all-female population of Tityus trivittatus from the Corrientes province (Argentina), which originated from a fully bi-sexual population. In addition we describe the ontogenetic development of these two parthenogenetic, buthid scorpions under laboratory conditions. The Dyar’s constant was evaluated for the carapace, metasomal segment V, and the movable finger of the pedipalp among the instars. The calculated growth factor has a total grand average of 1.26. Lychas tricarinatus females reached maturity after 220 days postembryonic development. 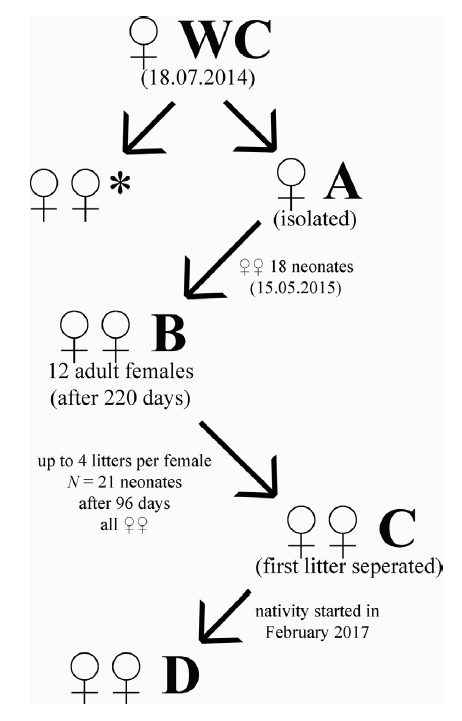 Moreover, L. tricarinatus females started to reproduce in the 6th or 7th instar and gave birth to an average of 21 neonates after 96 days of embryonic development. Tityus trivittatus matured in the 5th or 6th instar and gave birth after 230 days to an average of 13 neonates. Thanks to Mark Stockman for sending me this article!